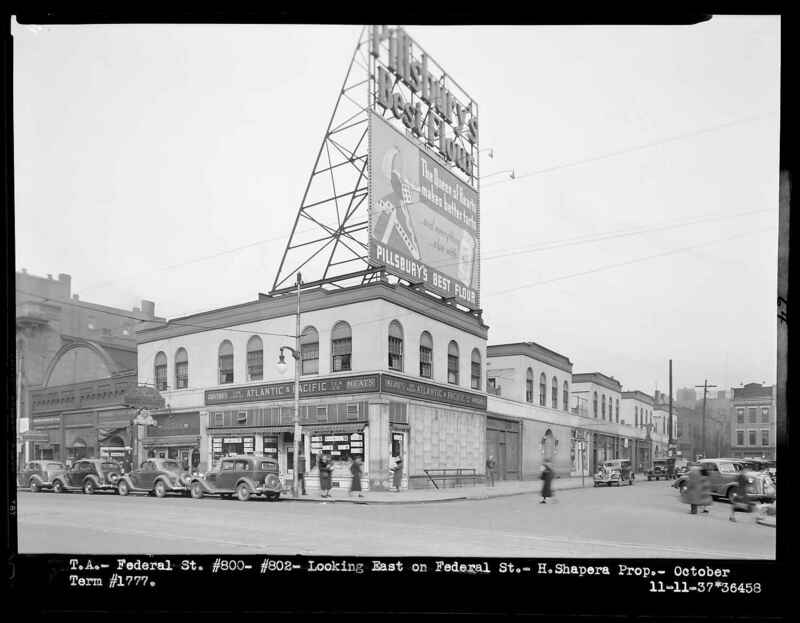 A view of 800-802 Federal Street showing an Atlantic and Pacific (A & P) grocery store with a billboard for Pillsbury Best Flour on its roof. Commercial buildings--Pennsylvania--Pittsburgh. ; Business districts--Pennsylvania--Pittsburgh. ; Grocery trade--Pennsylvania--Pittsburgh. ; Billboards--Pennsylvania--Pittsburgh. ; Streets--Pennsylvania--Pittsburgh. ; Motor vehicles--Pennsylvania--Pittsburgh. ; Pedestrians--Pennsylvania--Pittsburgh. ; Federal Street (Pittsburgh, Pa.). ; North Diamond Street East (Pittsburgh, Pa.). ; Allegheny Center (Pittsburgh, Pa.).